Breakfast 8 a.m. - 10:30 a.m. In the medieval heart of Siena, one of the main roads that are home to the University, Campo Regio Relais is located in a central location from which you can easily reach the main attractions of the city. Ideal for exploring the city and the neighboring medieval villages such as San Gimignano, Montalcino, Pienza and Montepulciano. The nearest airport is Florence, which is 80 Km away from the hotel. 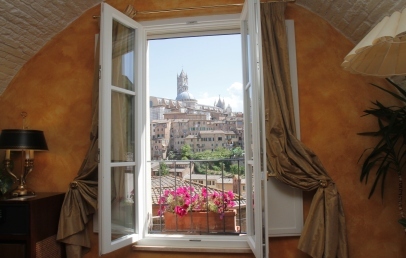 Charming boutique hotel housed in an historical building in the old town of Siena, divided over three floors connected by an elevator. The atmosphere is refined, elegant and discreet; it has six bedrooms and offers bed and breakfast service. Continental breakfast is served on the panoramic terrace, which offers breathtaking views over the Cathedral and the fascinating medieval city, or in the breakfast room. Campo Regio Relais has six soundproofed comfortable rooms divided in three typologies. Standard – 14 sqm, antique furniture, two windows overlooking Via della Sapienza. 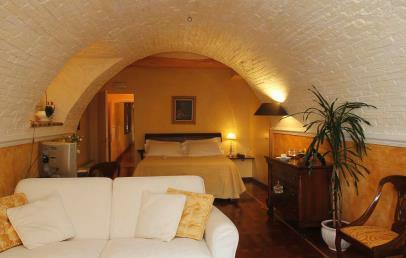 Superior – 24 sqm, empire style with a barrel-vaulted ceiling; it overlooks the tiny square of Camporegio. 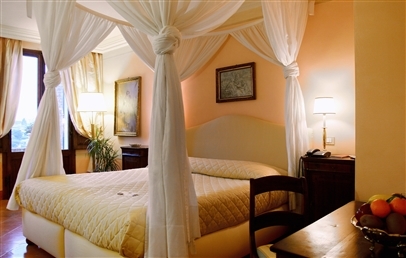 Deluxe – 24 sqm, four-poster bed, terrace with panoramic view over the city. The Superior and Deluxe rooms can accommodate up to 4 people, one double sofa bed will be used for the 3rd or 4th person. The Concierge is pleased to offer assistance for any need: restaurant reservations, museums, rentals and tips to find the best of the city and surroundings. Campo Regio Relais is located in a limited traffic zone; upon request and payment a park service can be arranged at the onsite parking garage, located just a few minutes from the hotel. At guests' disposal is a reading room with a small bar stocked with spirits, which guests can use freely and the beverages are against payment. Tourist tax – € 5,00 per person/day from March, 1st to October, 31st and € 3,00 per person/day from November, 1st to the end of February. The tax is to be paid on spot and in cash. Simple and stylish rooms, furnished with antique furniture of different styles depending on the room. 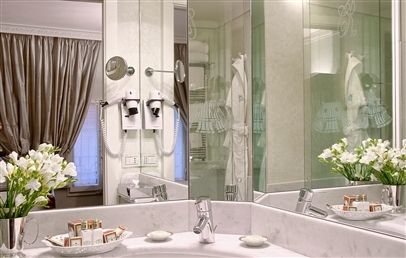 Private bathroom with spacious shower; embroidered linen, precious towels and bathrobes. 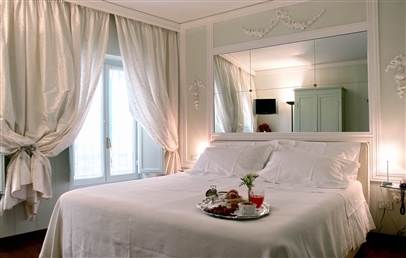 The rooms have two windows overlooking Via della Sapienza. Furnished in Emperor style with special barrel-vaulted ceiling, embroidered linen, precious towels and bathrobes. Private bathroom with spacious shower; the room is soundproof and overlooks the tiny square of Camporegio. Possibility to accommodate a third and fourth person in a double sofa bed. 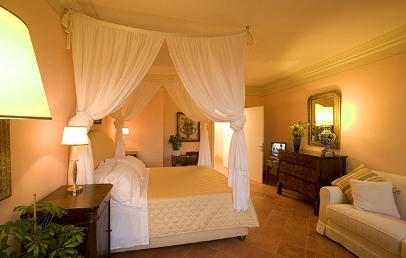 Furnished with antiques of the '700-'800, among them is an elegant four-poster bed. Private bathroom with spacious shower; the rooms are air-conditioned and soundproofed rooms and have a terrace of 10 sqm with city view. Possibility to accommodate a third and fourth person in a double sofa bed.